Formerly an arts graduate Val has had an eclectic career path, from theatrical costumier, fancy dress business owner, care worker, mime clown and belly dancer through to her current job at Heart of England Mencap. 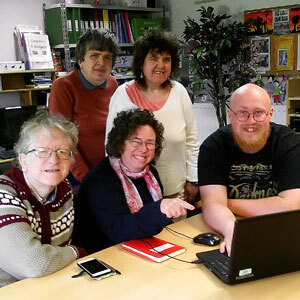 She has had several years’ experience as a presenter on Stratford Community Radio, North Cotswold Community Radio and The Alternative Show and is delighted to be back behind the mike with The Mencap Radio Show. Anna, who is married with 2 kids, is from a local Stratford family and went to Wroxall Abbey school. She completed a Duke of Edinburgh Award scheme before commencing her career in care, and has since worked with adults with learning difficulties for over 20 years. 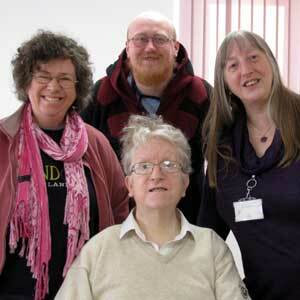 She has worked for Mencap since 2002 and Pathway Day Service for 5 years. Now an activities assistant with Heart of England Mencap she is enjoying her first time as a radio presenter. Charlie is a talented musician and costume/prop maker who originally attended Hereward College where he studied performing arts and music. He also studied music in Leamington Spa to National Diploma level and has taught music and creative writing. Now our technical whizz kid who sorts out any complicated computer problems and irons out the mistakes we make in the studio! Originally from Moreton in Marsh, Karl went to The Lambert School in Stratford. He has previous experience as a radio presenter at Warwick Hospital and is now finding his niche as Sir Sort-It on The Mencap Radio Show. He is a keen knitter and problem solver. Our research team work tirelessly every Tuesday afternoon editing, doing interviews, creating playlists, as well as researching and inventing new features. The team includes Jeffery (Weather Report), Becky, Lizzie and Janet.